Need some cute new hair accessories, for yourself or your kiddo? I’ve listed 10+ cute free hair accessories patterns and tutorials below. Do you have a favourite that’s not listed? Let me know in the comments below! I’ve separated the list into hair accessories made using felt, fabric (woven and knits) and yarn. Kitty Cat Hair clip by me! It may involve hand-sewing but it’s pretty small and goes quick! Use scraps of felt and make a whole bunch of these! Actually a brooch but could be adapted easily to be a hair accessory. I would add one more backing layer of felt and stitch all around the outside like in my kitty cat clip above and attach the alligator clip like I did for the kitty cat. Super simple and quick! Just a few layers of felt; use different colours of felt to make a rainbow of hair flowers! These would be great to use up scraps of your favourite fabrics. Pictured is the adult size but there is also a kid-sized headband available. Great way to use up some long thin scraps of knit fabric! Another super quick headband. Another cute fabric headband, this one has a cute tie front and elastic in the back to help keep it in place. 5 headband styles by 421 Myers Designs. You need to join their Facebook group in order to download the pattern free. This one uses a ready-made skinny headband. Showcase your favourite fabrics in another quick headband tutorial. Satin Flower headband tutorial by me! Step by step tutorial on how to create these large satin flowers. They’re not difficult and they’re oh so pretty! Make sure the fabric you use isn’t cotton though, you need a satin or chiffon, something that is not a natural fibre. It uses strips of leather, rope and ball chain to make a cute braided headband. Super quick! And for my yarn friends, the Criss-Cross cuff and headband crochet pattern by Little Birdie Secrets. I almost hesitate to post this one as it’s obviously best to wear in the Winter and it’s still Summer now. ..but as they say “winter is coming” so might as well be prepared. Check out the 4 different free headband patterns that Stephanie of Swoodson Says tested out here. 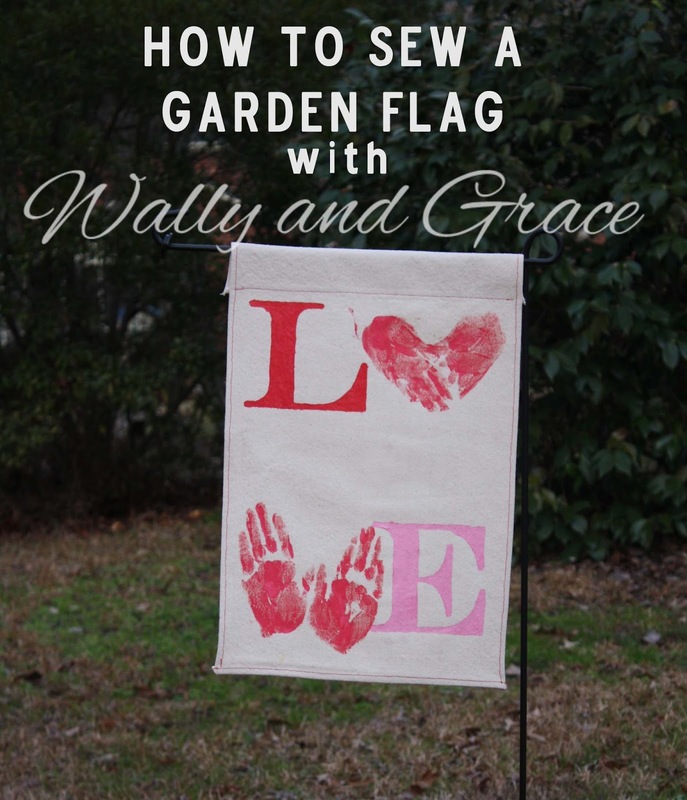 Amy of Wally and Grace is back with a tutorial to make a cute garden flag! Check out the interview with her to learn more about her and all her sewing inspirations. Read on to learn how to create your very own garden flag! I don’t know about you, but I love to see a little bit of color in the garden this time of year. It’s quick and easy to sew up one of these garden flags and there are endless ways to decorate it.